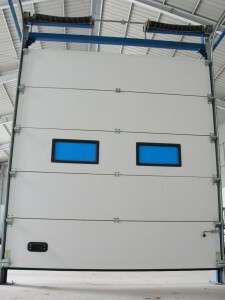 CB27 partial lifting door (sectional door) with technology and detailed key components are imported from Italy, so the quality is very high with many advanced features, durable, as well as technical requirements, easily repaired, easy for replacement. Partial lifting of C.B27 door is automatically balancing, automatic door stops at the desired position when lifting the door to manipulating the position and release. Door with 2 windows overlooking frequently to avoid collision. To be light to lift the door up and down easily.